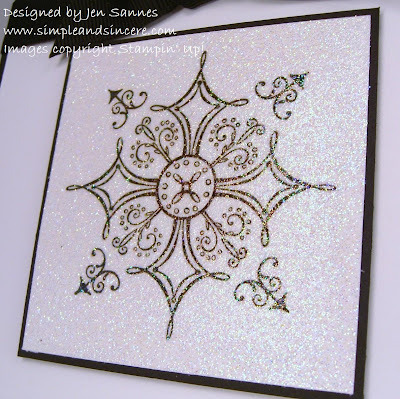 I stamped the main snowflake image (from Serene Snowflakes in the SU! Holiday Mini) in Basic Black ink on Whisper White cardstock. After the ink was dry, I used my VersaMark ink pad to cover the entire panel with ink and then I embossed it with Iridescent Ice embossing powder, which gives the snowflake an incredible sparkle. The picture really doesn't do it justice! I used my Basic Black marker and my "Peace, Love, Joy" stamp from All Holidays for the sentiment. 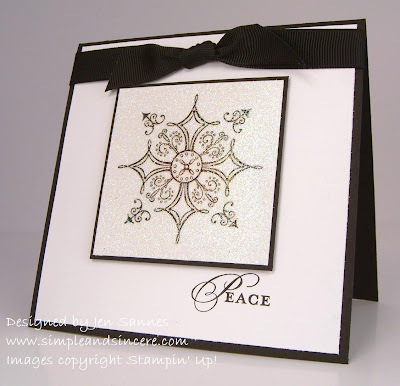 I inked up just the "Peace" part of the stamp and used my Stamp-a-ma-Jig to for placement. Want to play along? Hop on over to the CAS challenge forum and check it out! Ooooooo!! Lovely & very elegant!